If you had to describe Riddle in one word, it would definitely be cute. Riddle is very very cute. Although she still sports the too big paws of puppyhood, the rest of her is small, even for someone her age. She still holds some of her puppy chubbiness, but the slim and agile form she is growing into has begun to show through. 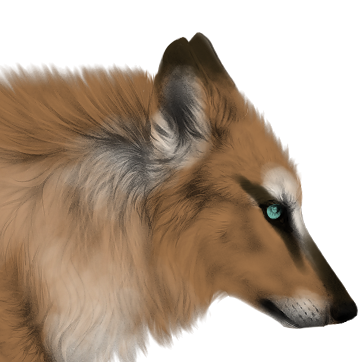 Riddle is a fairly light-colored wolfdog, though not as light as her mother’s white fur. Dusty tan fur covers most of her body, with accents of white and dark brown. The white mostly covers her underbelly, but there are patches of white around her ears, snout, and eyes. Her paw tips contain each a patch of white, reminiscent of socks. See, that’s super cute! The dark brown accents can be seen on the back of her hide legs, the top of her tail, and the tips of her ears and nose. The most interesting of her markings is the U-shaped dark brown marking on her lower back. It reminds Riddle of the wild brush strokes of her mother’s paintings. Across her eyes is a very deliberate dark brown slash, highlighting Riddle’s mint colored eyes. She smells strongly of the sea, as that is where she spends most of her mornings. While her Lupus form is slight of build, Riddle’s Secui form is very bulky. Her father (who is an absolute unit), seems to have passed down the large genes to her. She doesn’t prefer this form, as it majorly wrecks with her cute image. However, it is useful when she needs to be intimidating. There is nothing scarier than watching a small, cute wolfdog girl transforming into an absolute beast of an animal. *Has not shifted to this form yet. Oddly enough, Riddle still looks cute in Optime compared the terror she is while in Secui form. While her height is taller than she would prefer. Standing a good few inches above her litter-mate, she still maintains the adorableness from her puppy years. She prefers free-flowing clothing in greens and browns. Keeps her clothing options simple, as she can’t be bothered to put on an elaborate outfit when she has exploring to do. Besides, keeping things simple just shows how naturally cute she is ;) *Has not shifted to this form yet. Personality: Riddle is a very happy puppy. She is very energetic, rising with the sun already bursting with ideas of how to spend her day. Always willing to go out and explore with her litter-mate, Harley, though she mostly tags along to keep Harley out of too much trouble. Riddle is fairly level-headed (at least compared to some members of her family). She often acts as the voice of reason to Harley and her adventures. Though it doesn’t take much from Harley to get Riddle to indulge her sister. However, her favorite activity is exploring the rocky coast on the shoreline. She loves nothing more than rolling around in the sand and getting herself covered from tip to tail in sand and salt water. She gets up before most of her family, so she heads down to the shore for an hour or so before they can notice her absence. There she has hidden away all sorts of hidden treasures in a small cave that only she knows about. *Discovers this at eight months old. Generally, Riddle is very open with her family, but this is her one secret, which she holds close to her chest. It’s the one thing in her life she can have all by herself. She adores her family but sometimes they can be a bit...much. Especially since she is often the one chasing after her adventurous sister, her little hideaway is her way to decompress. So far in her life, she hasn’t had much experience with anything truly nefarious, so she is a bit naive. Though that naivety brings forth a brightness and friendliness that wouldn’t exist otherwise. She has made “friends” with the many strange and wonderful crustaceans and sea creatures she encounters on her morning outings. While definitely the most reserved out of all her siblings, when she meets a new creature or finds something new, all her caution is thrown to the wind. Biography: Riddle Damaichu is the daughter of Moon Moon Damaichu and Gullien Abascal. She was born along with her litter-mate and half-sister, Harley Damaichu on August 5, 2018. Born in Amherst, in the home of her father, her family stayed there until the disbandment of Sapient, her mother and “Step-Father”, Mads Ibsen’s, pack. Only a month old, Riddle, Harley, Moon Moon, Mads, Keylo (her grandfather), and her two brothers, Lazarus and Braith, moved to Cour des Miracles in the Shattered Coast. Her Father did not come with them and still lives in his home in Amherst. Riddle doesn’t remember much of her time before Cour des Miracles, so she considers that to be her home. Riddle and Harley spend much of their days together, either exploring with each other or just spending time with their family. Most of Riddle’s days are spent in the company of her sister, Harley, her “Step-Father” Mads, and her Grandfather Keylo. Moon Moon, her mother, spends time with them, but it's mostly playtime and she often disappears to have some alone time for herself. Riddle and Harley often get up to mischief, much to the chagrin of her Grandfather and “Step-Father”. Though as she matures, Riddle starts to curb her more adventurous tendencies to help her Da and Pawpaw keep an eye on her sister and mother. Wiki Profile: Click Here Extra: Currently, Riddle is still only a puppy. At five months old, she has not shifted into any of her forms yet and has yet to find her Hideaway. I just included that information for future reference.